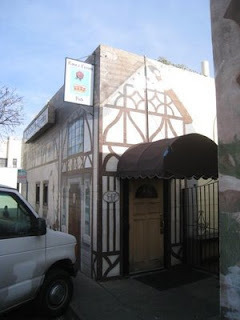 The Rose and Crown in Palo Alto is a classic English style pub set back from the street in a parking lot. It has been there forever, but my guess is lots of residents don’t even know it exists. It is so hidden. You know it is an English pub when you walk in at lunch time and people are sitting at the counter drinking Guinness. My friend Jeff and I decided to go there when he told me they have a good burger. I ordered the 1/3-pound Ground Beef Burger with cheese ($7.95). I added Stilton, of course, but I could of just as easily gone for Cheshire. The burger also came with their “famous” watercress mayo. I also ordered Onion rings ($5.95). Jeff got chips ($5.95) with his fish and chips. We sat outside and the food came quickly. The burger seemed a little small atop a great looking homemade bun that was very light colored and spongy. It was toasted perfectly and very tasty. 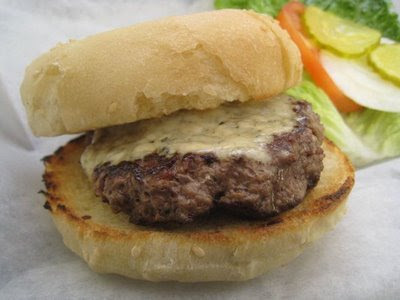 The burger itself was good with the Stilton and the deservedly famous mayo was very tasty. The best thing though was the chips. They cut the potatoes up every morning and fry them up thick, fresh and hot with vinegar. These may be the best fried potatoes I have ever had. The onion rings were more standard issue battered and medium thick. The Rose & Crown is a nice place to hang out for lunch. Quiet and inviting, it is a place I will go back for a Guinness ad some chips.